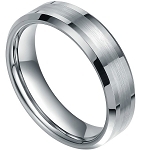 This Corso Classic 8mm Tungsten Ring with two brushed lines. This Classic Ring has a bit more of a unique touch of style with the two brushed lines. 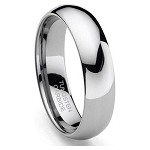 Very clean classic look for a night out on the town for yourself or a wedding ring for you and your partner. Q: We love this ring and would like it engraved. Do you engrave the outside or inside of the ring? A: Hi Mia, by default, we engrave the inside of the ring unless you tell us to engrave the outside. We can do either. If you would like the ring engraved on the outside, just let us know at checkout in the comments section. (it is on the very last page at checkout). Hope this helps! TF! I have the classic 8mm and when I saw this, I had to try it. Love the look and it goes great if I want to change the rings up a bit. Thank you for the fast shipping to Canada! Oh, and free shipping too! Love TF! I purchased my first Tungsten Fashion ring, as a replacement for husband to wear due to his job, back when they first opened in 2008! I took a leap of faith and boy was i pleasantly surprised. My husband loved the ring. He used it as his primary wedding band. He wore a size 14 at the time. Well he lost 50lbs and did not let me know the ring was loose. Fast forward...he lost his ring. I was devastated due to i bought it for our 4th wedding anniversary. So i came back to Tungsten Fashions and had my hubby pick out another ring. He choose the Corso Classic Tungsten. I was surprised because it is really a more dressier ring. Tungsten Fashions nor the ring did not disappoint us. Same quality, same great shipping, and same great price! Thank you Tungsten Fashions. A++++ Will purchase again. Very comfortable, and attractive. Best buy for the buck that I've seen in a long while. I may get more just to change looks now and then. This is the second ring I have bought for my husband. This ring is an excellent deal and looks great on him. It was shipped very quickly. I have recommended this site to my coworker and she plans to order her husband a ring, too! Great ring, even greater SERVICE! My husband and I were looking for matching bands and both really liked the Corso Classic. When our rings came in, my husbands fit perfectly but mine was too large. I contacted Tungsten Fashions and they sent me another one. Sadly it wasn't the same, so I reached out again and they promptly sent me another. It was over the holidays and evidently their resource was different, so long story short they finally were able to get me the correct ring and I love it! The most important part to me however was how they handled the situation; professionally, promptly, and always in my best interest. I am confident I will be purchasing from them again and highly recommend!!! Exactly as described. Beautiful in person. Perfect fit. Really fast delivery. Great ring , My Fiancee love the my ring . I am order one for her . We love this ring. 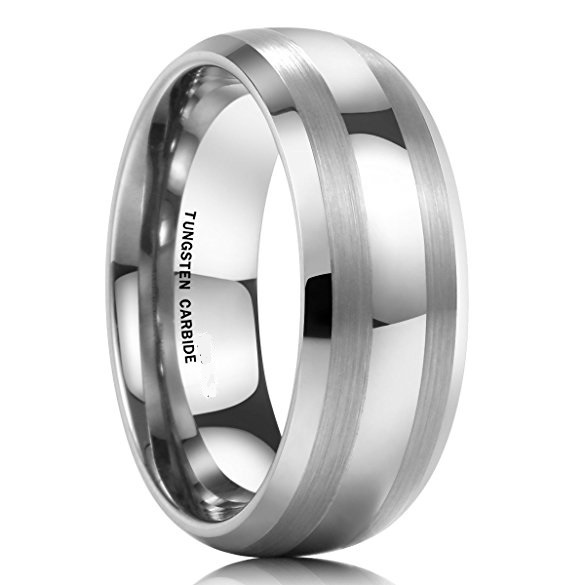 This is the second ring we ordered from Tungsten. We had ordered a more expensive ring from another company but didn't like it. We then ordered this ring. It fits perfectly and my husband likes how it feels. Fast delivery. No problems. Very good looking ring, excellent value and customer service. So of course we were concerned about the size but it fit perfectly! I actually got it for my boyfriend as a promise ring to match the one he got me and we absolutely love it! Looks a bit different in person than in the picture. Due to the width, its tight. Make sure you allow for the width when choosing a size. Other than that, Its perfect. Excellent fit and the comfort is far superior to the original wedding bands we bought 40 years ago. I've had them for 4 days and so far I very pleased with them.